When I tightened the shoelaces of my new running shoes at the start of this year I never dreamed that I would run a half marathon several months later. After giving up the sport over ten years ago, all I wanted was to get back in to running for a little variety in choice of hobbies. As I embarked on a 5K running plan I found in an old book from Runner's World, I 'ran' with my co-worker during lunch (he also started running at the beginning of the year). I say 'ran' even though it was more of a jog. I was never a runner and even when I ran years ago, I held 6.5 or 7 m.p.h for an hour on the treadmill. I never ran longer than that nor did I try to participate in any group running events. So when I signed up for the Rock 'n River Marathon, it was because I liked the crazy idea of running on the streets of downtown under the famous Reno Arch. I didn't want to pay registration fees and go all through the trouble involved with race day to do a short distance such as a 5K (3.1 miles) and even a 10K (6.1) wasn't worth the trouble (these race distances are different for serious runners, however, they compete in it to win and/or break their personal bests for those distances). If I was going to sign up for an event, I at least wanted it to be long enough and drawn out enough for me to enjoy it and wonder 'what was I thinking?!' 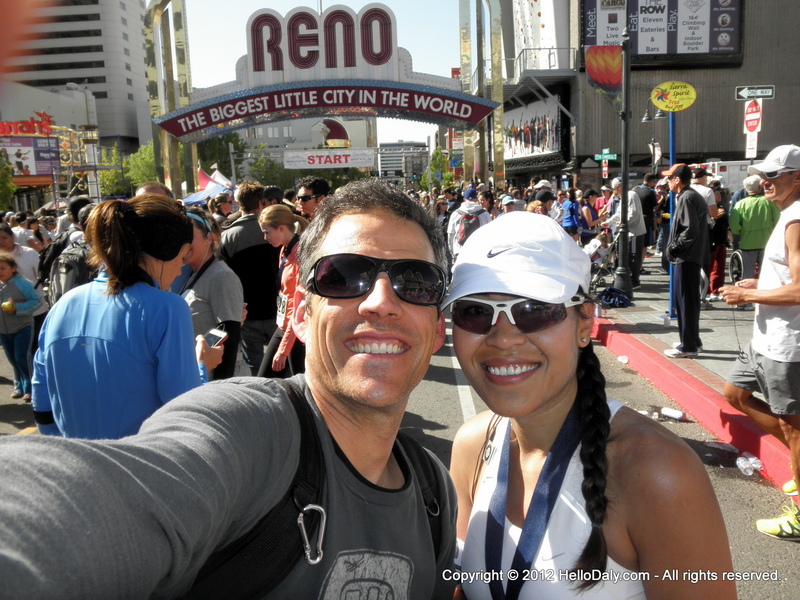 so I shot for something challenging and picked the half marathon (13.1 miles). Well those were exactly the words that ran through my head the day before. What if I can't finish? What if I cramp? Can I really run 13.1 miles? 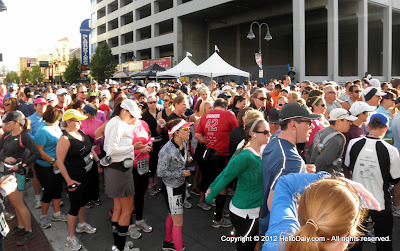 May people run for years or at least months before doing a half marathon and I only had been running for four months. In my attempts to be in the condition I needed to be in order to run the longest distance on foot in my life, I over trained and came down with common running injuries like very sore hip abductors and later, sore hip abductors. I started with a minimalist shoe (Saucony Kinvara 2) - great on the treadmill but after a couple months, my feet would get beat up on the road before I finally switched to the Newton Distance U the week before the race and I love it (it was my anniversary gift). The big day finally came and I had no choice but to toe the start line. I had no real reason to be as nervous as I was. I wasn't racing to win. I didn't have a finish time I had to beat. All I had hoped for was to finish and I was going there to have fun. This half marathon wasn't a test of after all the months of training -- it was a celebration of all the hours I'd invested on the pavement and belt of the treadmill. The work I put in was so I could run miles and miles and enjoy it all instead of suffering. And enjoy it I did!! Early Sunday morning of May 6th, I met my co-workers in downtown Reno where the race took place. 2,223 people registered for the event. The marathoners dashed off at 6:30 a.m. and we would soon follow at 7 a.m. It was cold but sunny and there were people in the crowd wearing blankets and garbage bags (make-shift wind jackets). 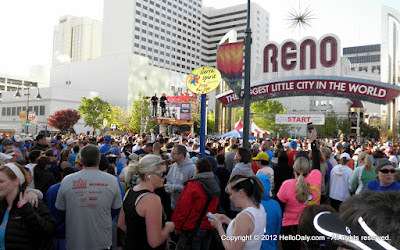 Then we were off and running underneath the famous Reno Arch and along the streets of downtown! As excited as I was, I made sure not to get caught up on the mass and make the mistake of running to fast. I had over 13 miles to go and wanted to make sure I could cross the finish line on two feet instead of crawling or worse...on a stretcher (little did I expect to see someone collapse just a few feet from the finish line). 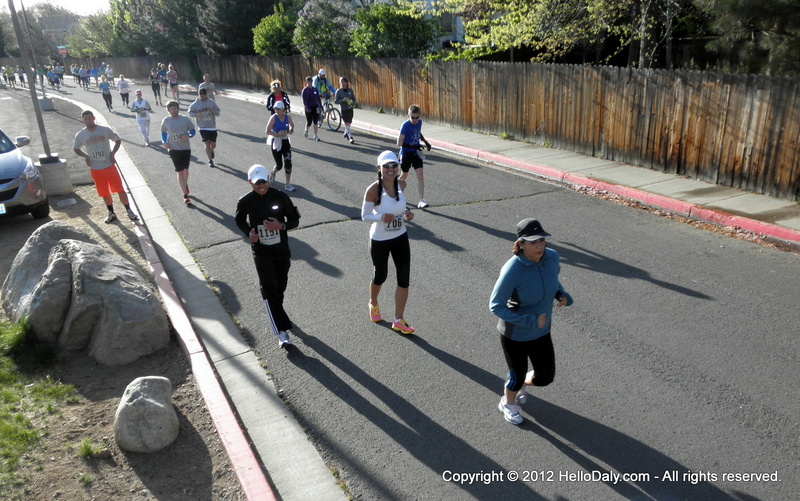 There were plenty of water stations and volunteers who cheered us on while watching traffic. Some wore hula skirts and others had cow bells. A couple of children waiting at the water station after the turn around point even gave me high fives -- that was so rad! John rode on his bike and met me at various points along the course to cheer me on. The day was absolutely beautiful -- cool, sunny, clear skies, and not a breeze. The course was flat. 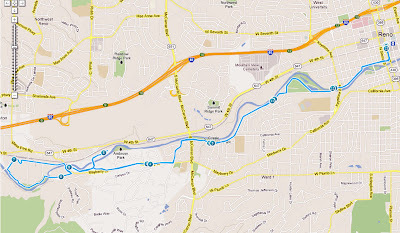 It started underneath the Reno Arch, through downtown and alongside several parks bordering the Truckee Meadows River. 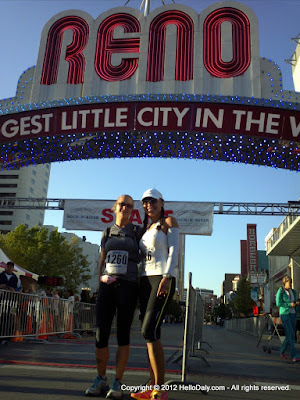 We ran through neighborhoods, on closed streets, through meadows, and over several wooden bridges over the river to the turn around point and then headed back through all the beautiful paths to downtown where we finished underneath the Reno Arch. The entire time I felt great like I could run all day!! I ran with my co-worker and we weren't going very hard because we wanted to pace ourselves. As we neared the end, we picked up our pace so we could finish strong. With the finish in sight, I knew that I could make it even if those side aches I can't seem to figure out rear their ugly heads. My co-worker dropped back to stick to his pace while I ran ahead for the last three miles. 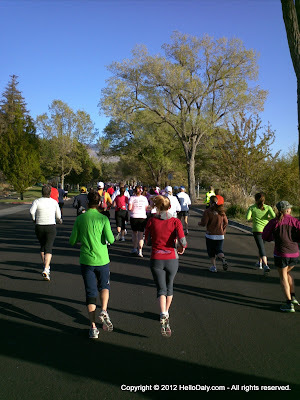 I kept my eyes ahead on the road slightly in front of me, plugged in my iPod, and ran. 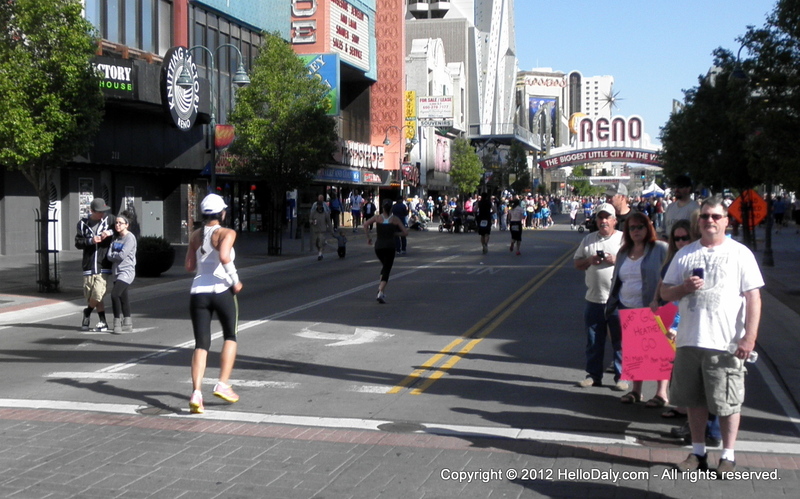 Ran past several folks along the way to the finish line. In the last tenth of a mile, I gave it everything I had and sprinted across the finish line. What a blast!! 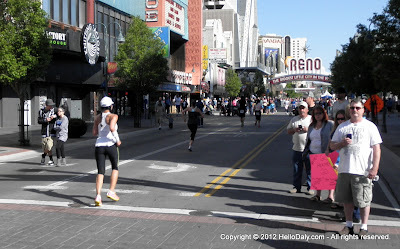 Then I ran back to find my co-worker and ran with him, cheering him on, until he crossed the finish line. John was so proud of me. 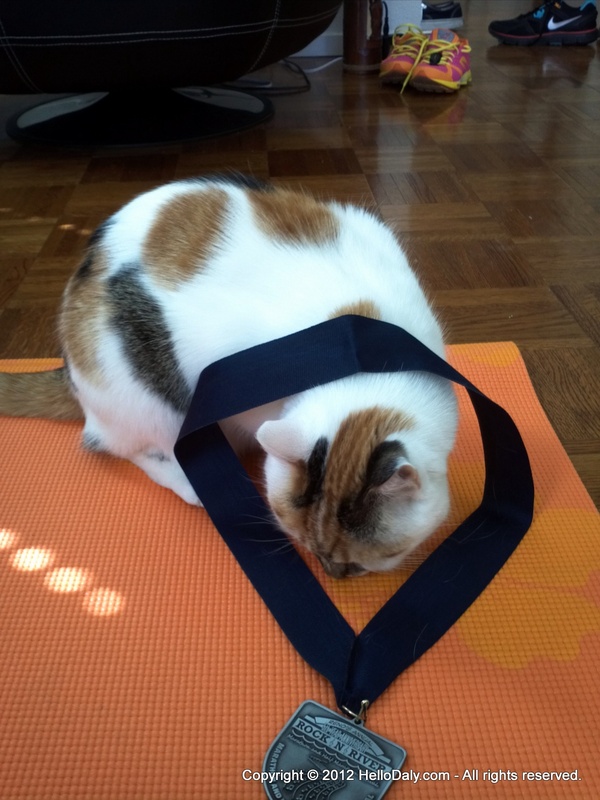 I, too, was happy about what I've accomplishment - to reap the rewards of the training efforts I put in for the past several months. Havi trying on my finisher's medal for size. 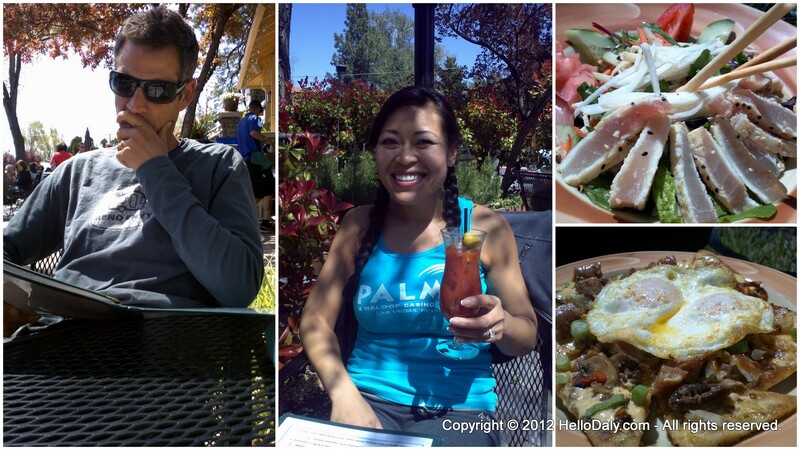 After that we went to lunch at the Stone House Cafe and sat outside in their patio area. It was our first visit since moving there and the food was just as good as I remembered! I am so grateful to have participated in such a wonderful community event. Thank you to all of the spectators, volunteers, police officers, emergency medical technicians, and local bands who were out there to ensure we had a fun and safe race. 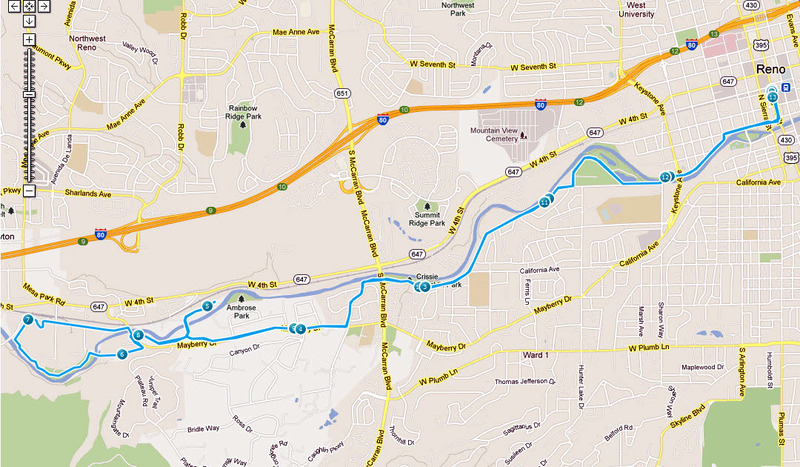 I already cannot wait to do the half marathon next year. Who knows, maybe I'll shoot for a marathon! Thanks Dolly! I now know the rush you must feel from racing. Congrats on a great job! As the proud parents of a Collegiate runner we know how hard it is to train. So keep it up! Hey you two!! How have you been? Thanks for the the pat on the back. I've always admired those who run, like my friend Dolly, and have a deeper appreciation for the time and effort it takes to prepare for and run in an event like this. I hope all is well with you both! We are doing great miss you on Malibustrings though.